Learn how the API User Security Policy is used to secure Community Manager administrator accounts. The "API User Security Policy" is the default security policy for Community Manager services and controls who can perform administrative actions on the Community Manager portal. When a user installs the Akana Community Manager, Akana Community Manager APIs, and Akana Community Manager OAuth Provider features, a series of services specific to Community Manager are added to the "Services" folder of the Community Manager Tenants" organization located in Policy Manager. The API User Security Policy is automatically assigned to these services during the installation of the Community Manager features. You can select View References on the Actions Portlet of the Policy Details page to view services that the policy is attached to, and can also view the policy attachment on the Operational Policy Attachment Portlet of any of the Community Manager services. Note: This service is for users that have installed the Akana Community Manager features. In Community Manager, when you add an API using the Add a New API function, you automatically become API Administrator for that API. You can also invite individuals who you would like to give administrator privileges to your API via the Community Manager API > Admins interface. The API creator and approved administrators can access the API. The "API User Security Policy" determines who the user is (administrator or standard user account). When a request comes to a Community Manager service, it is intercepted by the "API User Security Policy" before being processed. The policy checks to determine if the user is logged in, and whether the user is an administrator for the selected API or has a standard user account. Depending on the action, if the user is not authorized to perform the selected action, an error will be thrown or the option will be grayed out and not available for selection. This policy type does not require any configuration. A default API User Security Policy is added to the Policy Manager Management Console as part of the Community Manager installation. Let's take a quick walkthrough of the API User Security Policy configuration process to get you started. 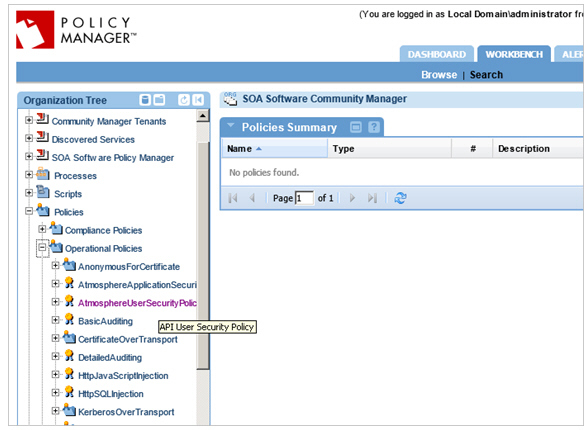 Verify that the API User Security Policy is present in the Policies folder of the Policy Manager root Organization as illustrated below. It should be added automatically as part of the Community Manager feature installation. The name assigned to the default policy is AtmosphereUserSecurityPolicy. 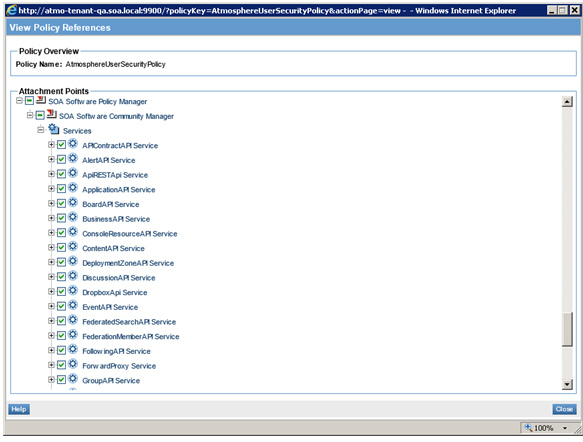 If the policy does not display, verify that you have correctly installed the Community Manager features. If you need an additional instance of the API User Security Policy to customize, use Add Policy to create one. You can view the services the default API User Security Policy is attached to by selecting View Policy References from the Actions Portlet on the Policy Details page. You can also view a policy attached to a service on the Policy Attachments Portlet in Akana Community Manager > Services > Service Details).